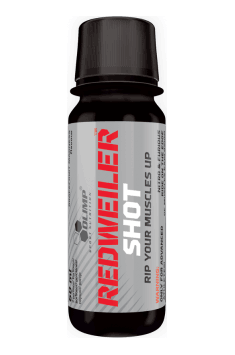 REDWEILER® SHOT is a devilishly strong pre-training shot, which can not be compared with what you've tried so far! It is remarkable what can be created when our specialists get down to it. - Caffeine with a huge dose of 580 mg per ampoule! Caffeine enhances the effectiveness of aerobic and anaerobic efforts as well as power during physical exertion. Alkaloid plays the role of a stimulant, blocking the breakdown of intracellular transmitter (cAMP), due to which the action of catecholamines such as adrenalin may be prolonged. It speeds up the metabolic rate by increasing thermogenesis and caloric expenditure. 1 portion a day = ½ ampoule (30 ml) around 30 minutes before training. Shake before use. 1 ampoule contains 2 portions for 2 days of use. After opening, store in the fridge in a sealed package and use during 48 h.
No need to use on non-workout days. Remember to follow the recommendations and do not use the whole ampoule at once and after opening do not use after 48 h. The preparation should be used half an hour before training. Ingredients: water, acidity regulators - sodium citrates, citric acid; flavourings, thickener - sodium carboxy methyl cellulose; sweeteners - acesulfame K, sucralose, cyclamates; salt, preservative - sorbic acid; colours: carotenes, carmines, riboflavins (for ORANGE JUICE flavour, GRAPEFRUIT MADNESS flavour), E 150d (for RAGING COLA flavour).